The Venetian Shuffleboard Table combines old world beauty, elegant curves and beautiful finishing with the finest playfield to produce a shuffleboard table that is sure to become a modern classic. The richness of the espresso finish and fine details are just part of the overall picture - choice hardwoods and solid construction ensure a product that will maintain its beauty and provide years of enjoyment. State of the art electronics and beautiful finishing adds to the beauty and fun! This handy hideaway drawer stores weights, powder, brushes and other accessories safely away. Keeps playfield clean and products hidden. A subtle 15 degree angle is just another fine detail and adds a bit of style to the already beautiful look of the table. The digital images on our website are as accurate as possible. However, color may vary slightly on different monitors. Contact your local dealer to chose the exact stain for your new table. 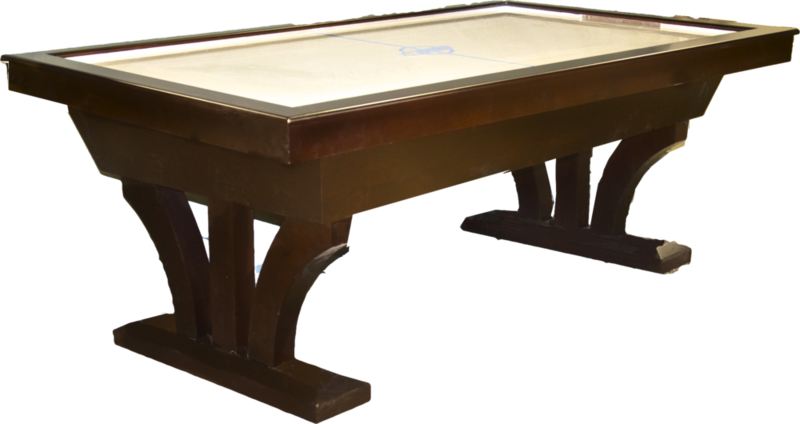 The Venetian Collection also includes a Connelly Billiards table, a Dynamo Hockey table and a Tornado Foosball table (not shown), for the complete gameroom solution.